Introducing Sunshine Wishes - So Happy For You! The card I made today is one of my swap cards using Sunshine Wishes. This set is so adorable and I can't wait to see all the different saying that can be made using this set. 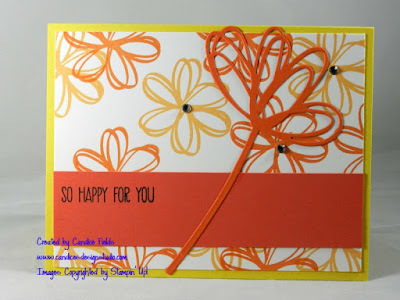 I created my own background paper using the flower stamp in the set using Peek-a-boo Peach and Tangerine Tango ink. I add some rhinestones for add embellishment. I love how this turned out! when your order reaches $350.00 or more before S&H and tax) . PLUS Stampin’ Rewards can be used on a Starter Kit. PLUS you can get (2) free stamp sets for joining the Stampin'Up! family for the month of June . Introducing Baby Bear by Stampin Up!